Don't you just love it when someone walks in your home and says, "Mmmmm, what smells so good??" Hearing those words is like getting a little pat on the back, a hug for the heart. Unless of course the good smelling stuff is a pumpkin spice candle or Mrs. Meyers Clean Day in action (I love that stuff!). But, if it's because you've been slaving away in the kitchen all afternoon, then you go on and bask in the sunny compliments! No matter what horrific state of disaster our house may be in, I'm pretty much always in the mood to put on my blinders and bake. Baking is kind of like therapy for me. Pies, cookies and cakes are good, but bread is by far my favorite. During the fall and winter months, the oven is pretty much on every day. The cold temps always seem to wake up some kind of monster appetites in my kids, so serving homemade bread with most meals is a great way to fill those rumbly tummies. Unfortunately, one loaf of homemade bread doesn't stretch very far in a family of 7 hungry men. Thankfully, I have found a way to bake several loaves at once in a very short amount of time. Now, before you go accusing me of getting all Martha Stewart on you, you should know that I would NEVER attempt to bake six loaves bread at one time unless I found an easy short cut of some kind, because, trust me, I value sanity more than nourishment. A few years ago, a friend of mine invited me to a bread class called No More Bricks. (Don't ya love that? I mean, I have no idea what she's talking about, do you?). Of course I was all, sign me up, man (anything to get out of the house)! Let me just say that I am so glad I actually went to the class and paid attention, because our family has been enjoying the benefits of my attendance ever since! Using the methods that Lori teaches in her No More Bricks class, the recipes/techniques she shares in her book, and the Bosch Universal Mixer, I am actually able to bake 6 loaves of homemade bread in a little less than an hour, from start to finish (with everything prepped and measured). Sometimes I mix up some dough and make cinnamon rolls, dinner rolls or other specialty breads, but most of the time, I just go for the simple loaves. Honey oat is our family favorite. She also has a tutorial on her website, so you can "take" the class in the comfort of your own home...unless you of course you need to get out of your home, then I suggest "taking the class" at a friend's house, preferably one who also drinks wine. I think bread baking kind of freaks people out, because it seems hard. I confess to disliking it prior to learning Lori's methods, because I'm kind of a "dump it in" or "throw it together" kind of cook, so exact measurements of anything stress me out. Lori's methods take the stress out of baking - and I mean it when I say, unless you forget half of the ingredients or leave your teenager in charge of the oven, you cannot screw this up. 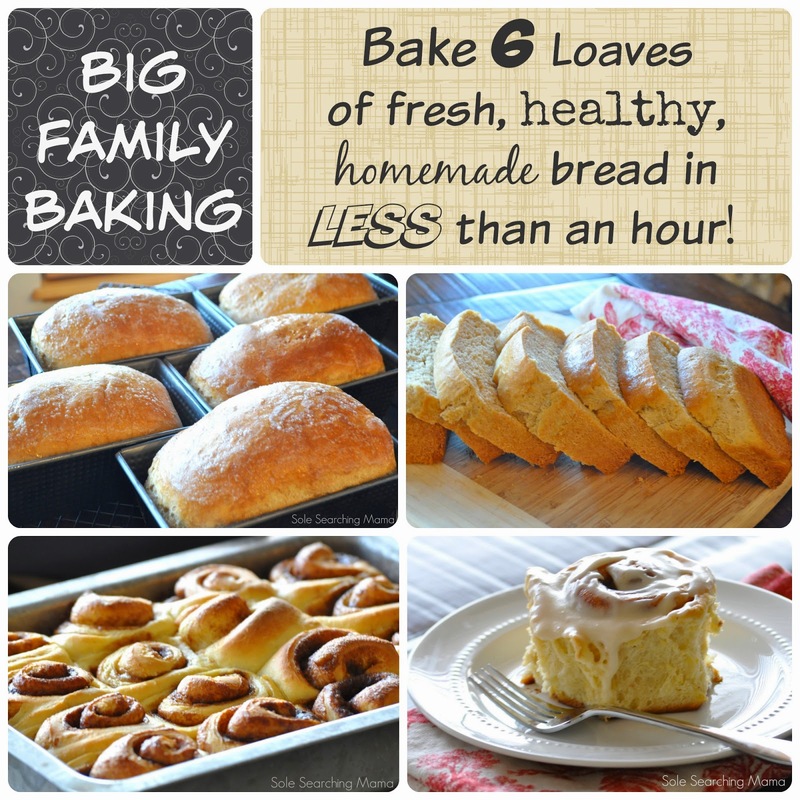 Each loaf is soft, light, and incredibly delicious every single time - no bricks! She does offer tips on making the most nutritious bread possible by grinding your own flour, but I'm just going to say right here and right now that adding "grind wheat for baking" to my weekly to-do list kind of makes my head explode. So, I buy quality flours from this company (sprouted grains are awesome!) and freeze what I'm not currently using. If you're the super creative/experimental/ambitious type, you'll love the section in her book that explains the various types of highly nutritious flours that are good for baking, which include quinoa, amaranth, spelt and oat, to name a few. As a bonus, her basic dough recipe can be used to make a variety of other breads, including rolls, buns and fancy twisty things. Okay kiddies. That's all I've got for today! What do you think? Do you have a preferred method or recipe for baking homemade bread? Wow!!! I love the smell and taste of freshly baked bread but I never make it. I hate to bake but I could maybe handle this method.